New Kardex Remstar LR 35 buffer storage system ensures just-in-time assembly. 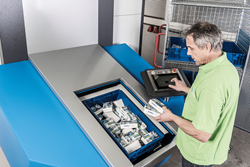 Kardex Remstar is meeting the manufacturing industry’s need for leaner processes and more flexible production with the new LR 35 storage and retrieval solution for small and medium-sized warehouses. Applying this new LR 35 Vertical Buffer Module solution to manufacturers with a wide range of products, can guarantee the just-in-time supply of fully picked assembly kits to keep the assembly process flowing. The continuous component assembly solution consists of the new Kardex Remstar LR 35 with an ergonomic turntable for order picking, Power Pick Global Smartpick 6000 warehouse management software, and an additional LR 35 used as interim buffer storage with automatic connection to the assembly area. If only a few bin types with standard dimensions are used for storing goods, then the storage volume in the LR 35 units can be optimally utilized in terms of depth and height. Compared to a mini-load system or static shelving, the footprint of the dense storage system is between 40-60 percent smaller, respectively, providing additional floor space for other revenue generating activities. The bins containing assembly parts picked from the first LR 35 are transported to the assembly area where they are placed into buffer storage in the second LR 35. Conveyor, trolleys or driverless transport systems can be used to transport the goods from the order picking area to the buffer storage area. Software-assisted batch picking saves even more resources when putting together the assembly orders. As soon as a technician requests the fully picked assembly sets they are retrieved by the second LR 35. Conveyor technology then ensures just-in-time delivery to the workstations. Compared to conventional shelving systems, the new assembly buffer solution increases throughput by 75%. All incoming assembly orders can be supplied at short notice. The orders are only started once all the components are available for picking. Bins sitting around the assembly area containing incomplete orders are a thing of the past. Picking information on the screen of the Kardex Remstar LR 35 supports the operator. The storing process can be done during daily business hours, because the unit has separate openings for storage and picking. Kardex Remstar, LLC, a company of the Kardex Group is a leading provider of automated storage and retrieval systems for manufacturing, distribution, warehousing, offices and institutions. For information about our dynamic storage solutions, call 800-639-5805, visit http://www.kardexremstar.com or stop by and see us in booth S2912 at Promat 2017.